Eric Welsh in a meeting with Samuel Goudsmit, Fred Wardenburg and Rupert Cecil. SIS operated more than one hundred intelligence operations in Norway during World War II, with about 200 agents shipped from Britain to Norway. Their principal operational goals were to gather information on German warships and ships traffic along the Norwegian coast. The normal communication channel was coded radio transmissions. 26 of the radio agents in Norway lost their lives during the war, either in combat, or after being captured by the Germans. 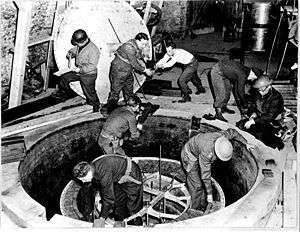 The German experimental nuclear pile at Haigerloch with Welsh in battledress at top centre. Rupert Cecil nearest camera. ↑ Nøkleby, Berit (1995). "Welsh, Eric". In Dahl; Hjeltnes; Nøkleby; Ringdal; Sørensen. Norsk krigsleksikon 1940–1945 (in Norwegian). Oslo: Cappelen. ISBN 82-02-14138-9. Retrieved 25 March 2013. ↑ Dorril, Stephen (2002). MI6: Inside the Covert World of Her Majesty's Intelligence Service. Simon and Schuster. ↑ Öhrström, Lars (2015). Den siste alkemisten i Paris (in Swedish). Fri Tanke Förlag. ↑ Nøkleby, Berit (1995). "Secret Intelligence Service, SIS". In Dahl; Hjeltnes; Nøkleby; Ringdal; Sørensen. Norsk krigsleksikon 1940–1945 (in Norwegian). Oslo: Cappelen. ISBN 82-02-14138-9. Retrieved 25 March 2013.